Fall has to be one of my favorite seasons simply for the fashions; I love the color palettes and the layering. I am writing this blog to show you a few of the current fall looks that I put together that will not break the bank! As I mention on my twitter constantly I am a huge fan of Forever 21 because they offer really fashion forward pieces at a low price. My biggest complaint about Forever 21 is that usually the stores are in complete chaos. One shirt will be in one area, a pile of the same in another. Most times, there seems to be no rhyme or reason. Although I can say that most stores seem to be getting better and the large H&M in Chicago on Michigan Avenue is immaculate, if disorder bothers you check out their online site where everything is all in neat sections! The first look was an outfit I put together to wear for my morning interview on Fox News Rising for Charlotte Fashion Week (as those of you from twitter will recall I missed it due to ridiculous traffic!) I wanted a look that was trendy, cute, and fun. I first found this burnt orange colored, suede-like skirt from Forever 21 for about 21. Since the skirt is a different color, I wanted a neutral top. I was able to find this tan top with orange and yellow embroidery on the top, which complemented the skirt perfectly. I paired it with a pair of cognac booties because dark brown just looked a little too harsh with the outfit. Forever 21 also carries a great selection of jewelry. With this, I would suggest some gold and wood bangles and some gold hoops. A medallion type necklace would also look nice. This outfit is so casual, fun it could be great for a variety of occasions, and the best is that the shirt, top, and accessories were only $50 in all! 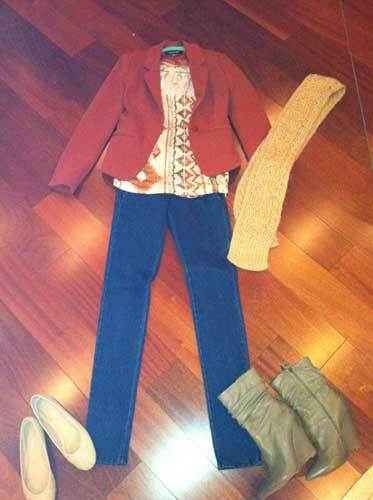 To wear this look into the winter, add a pair of tights and a cute jacket that hits around the waistline. I am really loving the 70’s trends that have been everywhere for the last few months. Flare jeans are universally flattering because of the cut the thigh always looks slimmer in comparison to a skinny jean. In addition, you can conceal a great shoe with some height under here to make your legs look a mile long. I scored these cute flares with button detailing on the front from Forever 21 for under $25. They run true to size and have great stretch to them. To be honest with you I tried on a number of flares from J Brand, Paige, etc. which average around $170 and I much preferred the fit of these ones from Forever 21. Here I tucked in a simple, form-fitting white turtleneck from Victoria Secret in order to show off the buttons. With such a simple outfit, you can really play around with accessories. A floppy style hat and big sunglasses are perfect for lunch with the girls or a chunky necklace will jazz it up. Another trend that continues to stay hot through the fall are colored, skinny jeans. If you look online, you can find all shades. I like to pair them with a solid, neutral top so that the look it not too loud. I sported this look in Loudon by wearing a pair of wine colored jeans (purchased from Wet Seal for $25) and a black sheer loose tank top. The tank top was purchased from Wal-Mart in the Miley Cyrus collection for only $8! I paired it with a hot pair of open toe leopard booties that are currently in store at BCBG to really make the look pop! With the loud colored pants and funky shoes I opted to keep the accessories minimal and simple with a plain gold necklace and a gold bracelet. Finally, I was asked to do a short clip for Inside NASCAR on Showtime and I needed a cute outfit to walk around Chicago in. As those of you from Illinois know it is already a bit chilly there. I wanted to wear something cute but did not want to put on a big coat. I opted for a great tribal print shirt I found at Forever 21 for about $15. It has orange, olive, and cream in the print and I built my outfit around this shirt. Since it was chilly, I paired it with a great orange textured blazer also from Forever 21 for $20 and a tan scarf. I put on simple dark skinny jeans, a must have staple for your closet. I wanted to pull some of the olive from the shirt so I went with a green/taupe wedge bootie to complete the look. I have received many wonderful emails from you guys pertaining to shopping on a budget and hot fall looks. I really hope you guys like this blog and please keep the emails coming!